I follow the SRECTrade blog for New York related solar news. You can find the latest update here. It contains this bit of unwelcome news. On another note, the much anticipated, “NY Solar Jobs Act” legislation, formally bill A05713 has been watered down under a renamed Assembly Bill A09149. This new bill, proposed by Assemblyman Steven Englebright eliminates language creating a state-wide SREC market due to push back from the New York Senate and Governor’s office. See the full text of Assembly Bill A09149. Interesting how they say, “due to push back from the New York Senate and Governor’s office.” I’m sure the push back is from the utilities that supply money to the Senate and Governor’s political campaigns. I understand the logic of letting the utilities decide how to best meet their solar targets, but I also imagine the utilities will choose options that put the most money in their pockets rather than the many small local producers of solar power in the state. I do not see any advantage to letting each utility determine it’s own path to meeting the targets and will only make the sale of solar systems to residential customers more complicated and costly. SREC’s may not be the best way to encourage solar adoption in the state, but there doesn’t seem to be any better state-wide options being proposed by Cuomo’s administration. Just a reminder. 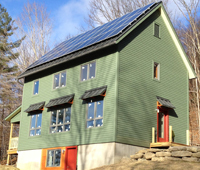 The Green Building Open House Tour, sponsored by NESEA, and the National Solar Tour, sponsored by the American Solar Energy Society, is October 13 this year from 10 to 4. Last year we opened our house while still under construction. This year we’re showcasing the finished house and data that we’ve been collecting along the way. A listing of local New York houses in the greater Albany region are listed on Our Energy Independent Community site. Put it in your calendar. Come see us and some of the best green houses in upstate New York. We generated 1,018 kWh in August, up 5% from last month. That is our best month yet, and our best daily average of 32.8 kWh per day as compared to the last two month’s average of 31.3 kWh per day. Typically solar generation starts to decline in August, with decreasing sunlight hours, more clouds and more heat, but not this year. We used 315 kWh, 1% less than the previous month. We used the air conditioning for only 3 days. We used 10 kWh for cooling / dehumidification, 3% of our month’s total usage. We generated a 703 kWh surplus this month, our 6th surplus month in a row and highest yet. I was surprised that our usage for the month was lower than last month. We’ve been using the stove like crazy canning tomatoes, dehydrating veggies and making lots of pesto. The big energy saver this month was less need for cooling and dehumidification. The number of hours we experienced temperature values below 68F increased to 56 HDD, although this is still below the average of 90 HDD for August in our area. Our water usage is also back down to a more normal summer range of 79.5 gallons per day. You can see heat maps and detailed charts of temperature and electrical usage at netplusdesign.com. View solar, usage, net usage, temperatures and HDD for all of February and circuit-level data for 16 days in March and the full months of April through August.